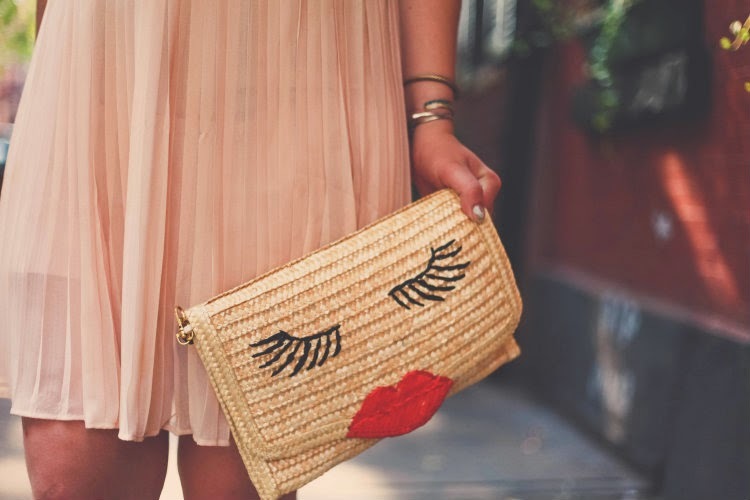 This outfit is totally about my favorite novelty bag... this little lady with the luscious lips and beautiful lashes! I wore this look to a wedding a few weeks ago with my boyfriend. 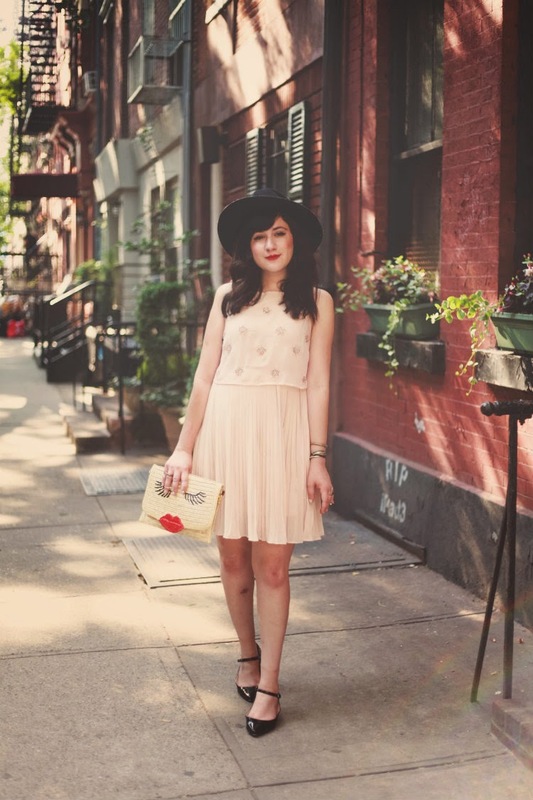 I think this blush pink dress is perfect for a summer wedding! So breezy and flowy... plus it was great for dancing! Anyway, this post has to be short and sweet because I am currently on set with Teen Vogue doing a special project! Hope you all have a great weekend! This bag totally reminds me of a pair of boots I saw (but never bought) years ago. Such a cheeky little face, great find! Looking fwd to seeing your Teen Vogue collab! 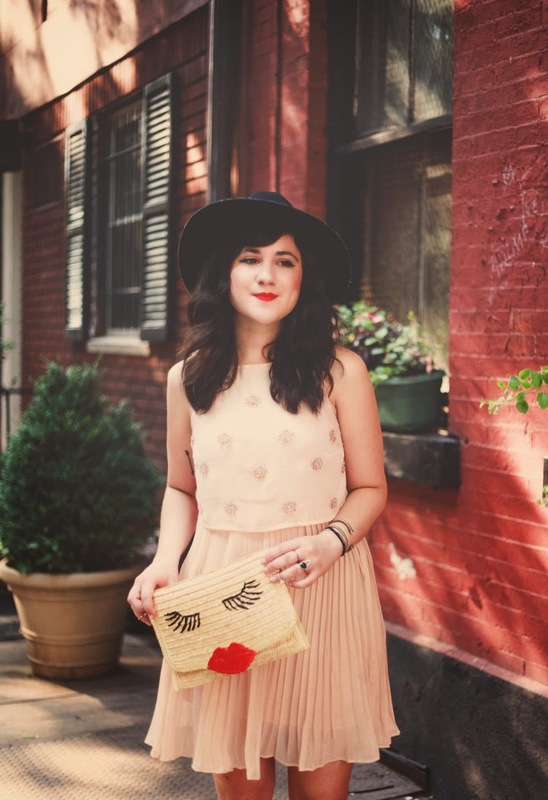 This is such a perfect wedding outfit, and the clutch is so cute! Super, super cute outfit! I like your style so much! Such a lovely dress, perfect for a wedding! That purse is so perfect for you! What an adorable purse! I really love that dress too, such a beautiful colour. I seriously NEED this outfit! What a lovely look! Classic Bonnie: Femme and adorably romantic. I must agree with you about the bag. I love eccentric accessories and that bag perfectly fits right into that category! Totally cute! Untuk admin tetap semangat dalam memberikan informasinya, saya sangat mendukung !! terimakasih..
the dress is indeed perfect for a summer wedding! Such a beautiful dress on you! Loving the adorable clutch too! LOVE the dress! and totally cute clutch!! suuuch a stunning dress, love it! terimakasih telah berkenan sharing artikel anda mas admin, sangat menarik dan menambah wawasan..
banyak wawasan yg terdapat dalam website ini,,thanks admin..
Terimakasih informasinya pak membantu sekali ..
informasi yang sangat bermanfaat dan sangat menarik gan, terima kasih .. 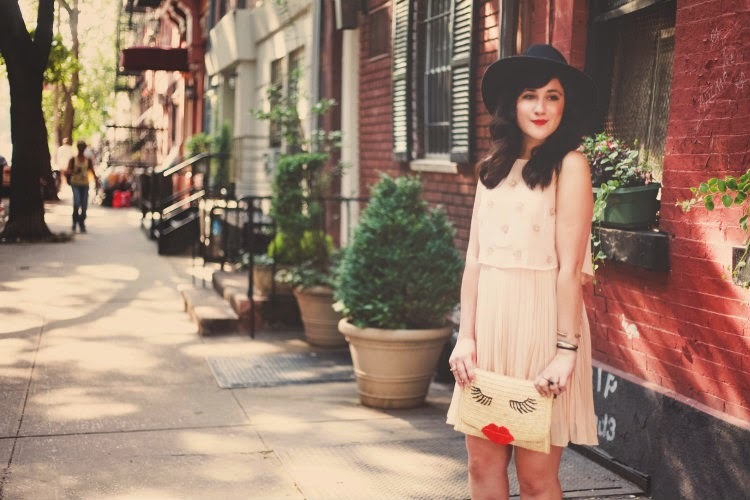 This outfit is oh so lovely :) And *that purse* is far too adorable for words! So pretty! Wow very nice blog of dress. I like this dress. All the dresses are looking so stylist and beautiful that can easily drag the attention of any customers very easily. The quality of this dress was outstanding! Womens Clothing Fashion by Dressspace includes amazing Italian designer collection by Angelos-Frentzos, Capannolo, Jan & Carlos, Clare Tough, Damir Doma, Delphine Wilson, Issei Fujita, Jennifer Sindon, Cristian Luppi, Osamn Yousefzada, Vivia Ferragamo, Noria Nakanishi etc.